Batak Ponies are from Indonesia originating in Central Sumatra. They are thought to have descended from Mongolian and Arabian horses, and have continually been infused with additional Arabian blood to improve their quality. They are selectively breed by the Indonesians, and are often used to upgrade the quality of horses and ponies on nearby islands. The Batak Pony was once used as a sacrificial animal in religious ceremony. They are slender, but still strong and sturdy. They are generally well-conformed. Poor forage is a major contributor to conformation abnormalities. The only other breed of the country which is of better quality is the Sandalwood Pony. The ponies have a fine head with a straight or slightly convex profile. The neck is short and thin, the withers are prominent. The chest and frame are narrow, the back is usually long, and the quarters sloping. The tail is set and carried quite high. 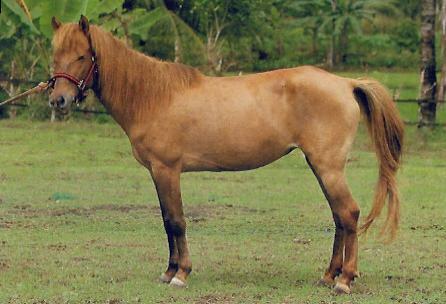 The Batak pony is considered a very willing breed, and is quite hardy. They are easy keepers. They usually average about 11.3 hh but may stand up to 13 hands, and are generally brown, but can be any color. The Arabian blood makes it spirited when needed, but the pony is generally quiet enough for children to ride, with an excellent temperament. Their speed also makes them popular for racing among the local population.